How should one act when consequences are uncertain? Our family watched The Post a couple weekends ago. And then All The Presidents Men. 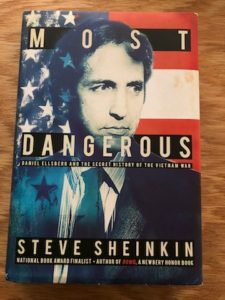 And that prompted several us to read (reread) Most Dangerous: Daniel Ellsberg and the Secret History of the Vietnam War by the always excellent Steve Sheinkin. I’d gotten most of the way through this book, but not quite finished when I had to STOP EVERYTHING AND MOVE in November 2015. I’m glad I came back to it. I listened to it, which was good, but the physical book has pictures. Just saying. The book + movies made a good mashup with great relevance to the current day and I highly recommend all.